A Tonk's Tail... err, Tale...: Wednesday's Waif: Mufasa! My name is Mufasa. I am one of the sweetest, gentlest, friendliest cats you will ever know. I came from a hoarding group, and many believe I was the dad to several of the other cats brought to Wayside. I was fostered for a few weeks, and my Foster Mom totally fell in love with me. What can I say, I am a charming guy! I love to be petted, I love to be held. And I LOVE to be kissed over and over and over. I am a soulful kind of guy who likes to look right into your eyes. I am playful too. I love me a good round of chase with the toy mouse. Well, and wand toys, of course. What kitty doesn't like those? Overall, I am pretty mellow and just happy to be around you. My personality is called the "Personal Assistant," and my Foster Mom says that is absolutely correct. Foster Mom says I am purrrfect. I bet you will think so too when you come out to meet me. I hope that'll be soon! 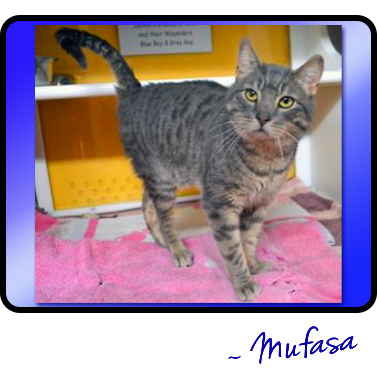 Mufasa is available for adoption today at Allie's Alma Mater, Wayside Waifs! Mufasa seems like a really nice guy! Mufasa is quite popular at Wayside. He is irresistable. Even though he is 8 yrs young, I can't imagine he will be there much longer before finding his forever home. One of THE toughest fosters I've ever had to bring back. He's a handsome guy. We hope he finds his forever home soon!